Not hurting is relatively easy. But not being hurt is seldom in one’s control; for it is a matter of heart. Avoiding being hurt and heartbroken, therefore, is possible only by becoming immune the poisonous, heart-piercing arrows shot by mortals. The strength of this immunity depends on the level acquired in cleansing the soul and purifying the heart. On being stoned and insulted in Taif, the Blessed Prophet –upon him blessings and peace- was met with an angel, who assured him that he could, with a word, “…strike the two mountains, surrounding Taif together, and destroy the locals”. This is a mindset acquired only through education in its truest form; a mindset belonging to a heart purified through spiritual training. Is to not hurt, devotee, and not be hurt! (*) See, Bukhari, Badu’l-Khalq, 7; Muslim, Jihad, 111. 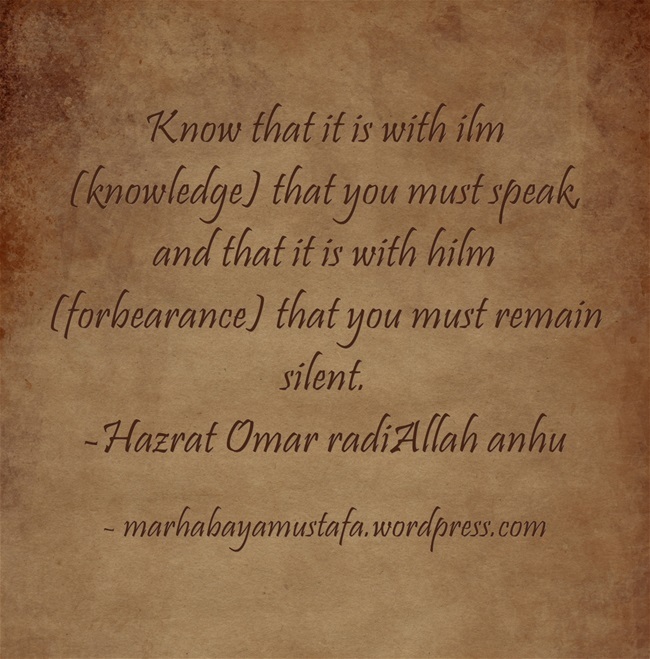 We cannot think of time and space for Allah (جل جلاله), who transcends all dimensions. (*) Existent in pre-eternity, His existence comes from Himself without need for any other. That stated, the Almighty nonetheless willed to be known and hence created existence, the world of plurality (âlam’ul-kasrat), which is also called mâ siwallâh, denoting anything other than Allah (جل جلاله). (**) In the process of creation, He first created a light that is the essence of Haqîqat’ul- Muhammadiya, the Muhammedan Reality. A precious gem is kept in an ornamented box, not a rudimentary one. Seen in this respect, the Muhammedan Light is the precious gem hidden in the rest of creation, the ornamented box serving to preserve it. Beings were created only for the sake of his greatness. It could therefore be said that Allah (جل جلاله), created existence to ornament the Muhammedan Light. In the language of divinity, the Almighty is the origin of creation, possessing absolute freedom to do anything He wills, while the cause is the Muhammedan Light, the first creation. In other words, the Blessed Prophet ﷺ was created and thus entrusted with the mission of prophethood well before the creation of Adam (Alaihi Salaam). 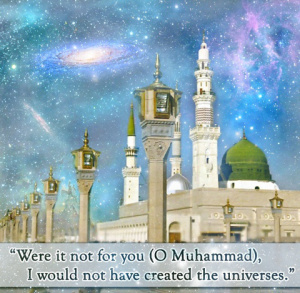 His bodily manifestation on Earth, however, marks the final page of the book that is prophetic history, which means that the first page of that very book was turned with the Muhammedan Light and similarly came to a close with the embodiment of Muhammad ﷺ as a Prophet on the physical plane. ‘How do you know Muhammad’s name when I have not yet created him?’ the Almighty asked. Which He loved, the Generous, the Great. Thus the Muhammadan Light, labeled also as the Muhammedan Truth, is an essence that represents the spiritual identity of the Blessed Prophet ﷺ. It is he who is the most beloved and the most precious in the sight of the Creator. The reason for the existence of creation is the love of the Almighty towards the Muhammedan Light, the first entity created. The entire universe has therefore been given existence in the honor of the Muhammadan Light, the core which it envelops. Existence is only to expose and explain his reality. Having said that, just as it is impossible to pour an ocean into a cup, it is inconceivable to understand the Muhammadan Light as befits its nature. (*)The human mind is of a nature that can think only within the bounds of space and time. Through the impressions it receives from the physical world, it can, albeit to a certain degree, reach Truth. Bound by the impressions received from the world of observation to refer to the truths that transcend the observational realm, both in terms designating and insinuating the content of metaphysical truths, man is thus virtually compelled to resort to metaphor. (**) Ma siwallah is a term used to indicate all that which is other than Allah Y, and which keeps one away from Him. 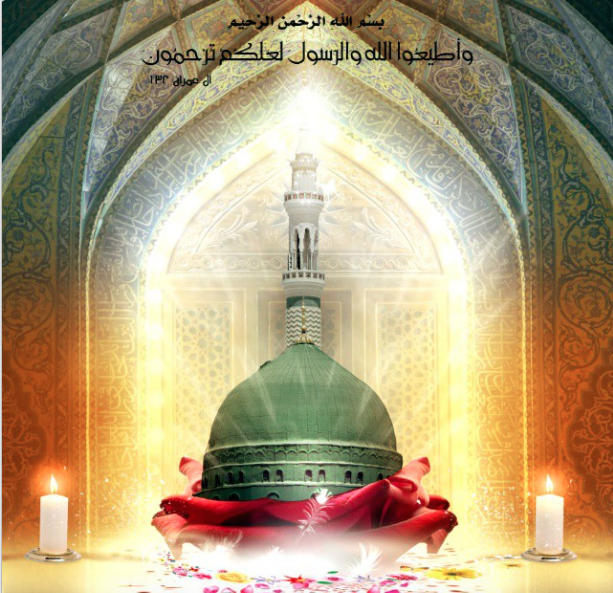 (***) The other couplets of Sulayman Chalabi’s Mawlid pay further lyrical tribute to the Blessed Prophet ﷺ being the Light of Existence and that the universe was created but in honor of the Muhammedan Light. O you who believe! be careful of (your duty to) Allah and be with the true ones. (Tawbah, 9/119). O you who believe! be careful of (your duty to) Allah and seek means of nearness to Him and strive hard in His way that you may be successful. (Ma’idah, 5/35). Being sultan of the world is nothing but stupid struggle. Serving a friend of Allah is a greater glory! So in order to protect oneself as an honored servant of Allah, a sincere Muslim should keep company with other committed Muslims from whom he or she can spiritually benefit. Every human being needs a spiritual guide. It is because of this need that Allah Almighty made the very first human a prophet. 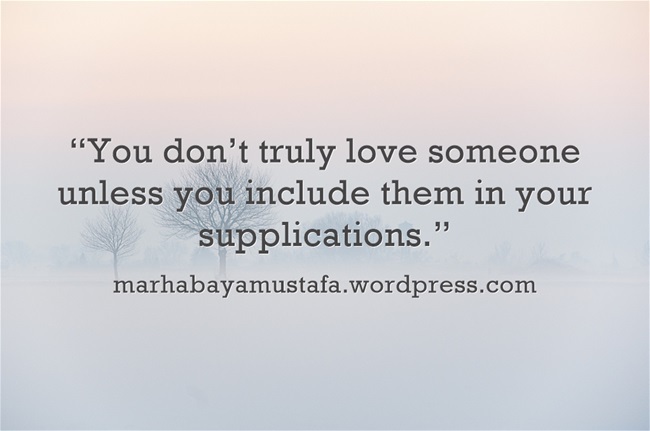 Sa`di al-Shirazi (rah) makes a point about the effect of our companions on our condition. He said, “The dog of the Seven Sleepers attained great honor, gaining mention in history and in the Qur’an, for it kept company with the righteous. The wives of Prophets Noah and Lut, on the other hand, were ranked among blasphemers, for they kept company with the faithless.” As this story makes clear, keeping company with ignorant and blasphemous people draws one come closer to their way of life and thought. Mental connection leads to spiritual connection, and the wrong spiritual connection can lead to spiritual corruption. 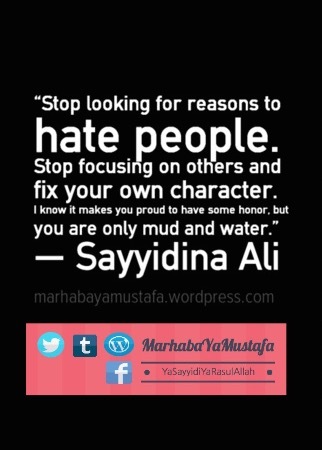 Stop Looking For Reasons To Hate People…. Live in this world without…. 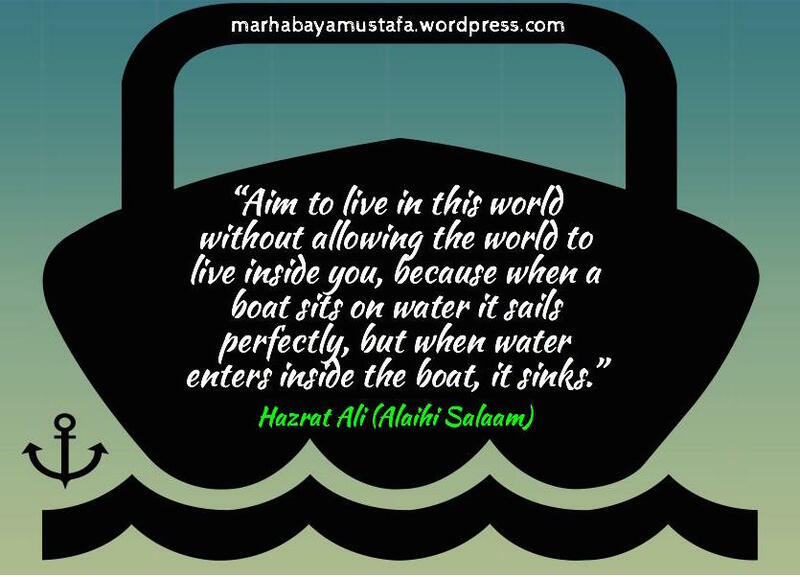 Aim to live in this world without allowing the world to live inside you, because when a boat sits on water it sails perfectly, but when water enters inside the boat, it sinks.